In this sequel the (still jolly) postman rides his bike delivering Christmas cards to various nursery rhyme characters. He makes his way finally to Santa’s workshop and receives a lift home in Santa’s sleigh. 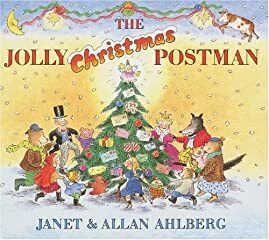 Like the first book, The Jolly Postman, this book has built in envelopes holding cards, letters and little surprises for children to discover. The ‘where are they now’ angle on popular nursery rhyme and fairy tale characters is very appealing. Apparently Goldilocks and the Bears are on excellent terms, and even Red Riding Hood and the Wolf correspond regularly. Humpty is still in the hospital and rather prone to falls. At the end the Postman himself receives a little gift from Santa before going home to his warm fire and sleeping dog. Bright, cheerful illustrations and ‘inside jokes’ make this a warm and slightly cheeky Christmas treat. The envelope-pages and surprises within should delight children from about 4 up. (Even more appealing when the child can read the little letters on their own – age 6 or 7ish.) A perfect gift idea for the season.